Swimming has a doping problem. And no, this isn’t a history lesson about the notorious 70s and 80s. Or 90s. This is now, and its spreading. The issue came up most recently with a surge of recent doping suspensions of Russians, including world record holder Yuliya Efimova, former world record holder Sergey Makov, and now open water reigning world champion Vladimir Dyatchin. In fact, its so bad that Russian Sports Minister stated that the Russian swimming federation, and a few other Russian sports federations, are on the brink of suspension. The problem is, you don’t have to dig too deep to find doping violations for high level swimmers from many countries over the last few years. Here’s a breakdown by year of the 326 FINA doping suspensions of athletes since 2001. (I ignored coaching suspensions as these were typically tied to specific athlete suspensions). Keep in mind that these suspensions include swimming, diving, synchronized swimming and water polo, although swimming dominates the list. 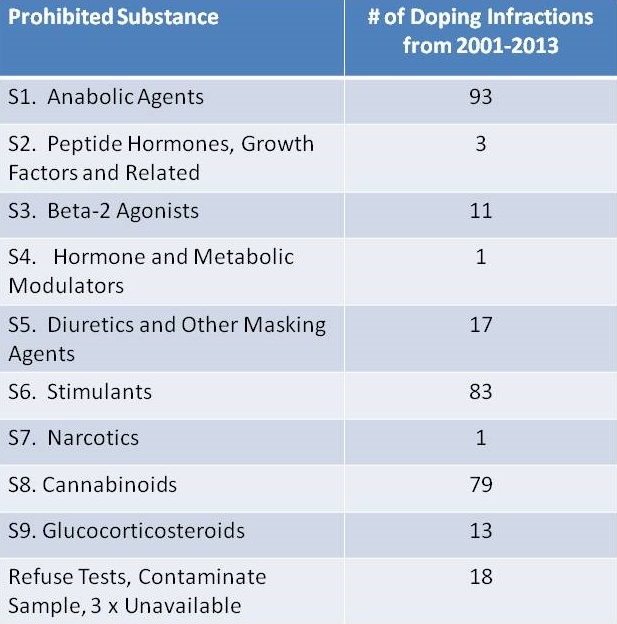 We can see that doping violations have roughly doubled in the last 10 years. But it’s actually much worse than that. These violations include 79 suspensions for Class S8 – Cannabinoids, spread roughly equally across the years other than a slight drop in the last two years. I consider these to be violations of stupidity more than anything else. When we take those out of our data we get the following chart. Below is a table of the violations by category over the 2001-2013 time frame. We can see 3 very popular areas of cheating. Topping the list are the Anabolic Agents (93), with Stimulants (83) coming in a close 2nd. Stupidity (79 – Cannabinoids) comes a close third. Nothing else comes even close to those numbers, although masking agents seems to be increasing. Here’s a chart of the top 4 doping violation categories by year since 2001. I ignored the administrative category which includes refusal to test, contaminating the sample, and 3 x unavailability). Here we can see that stimulants are the fastest rising category, with anabolics staying more or less the same. At a much lower scale, but still worrying is the apparent increase in masking agents. Now, which countries are creating the highest numbers of positive tests? Below is a chart that shows the top 10 countries over the period 2001-2013. With all the news lately, there’s no big surprise to see Russia and Brazil in the top 5 countries. And I suppose given China’s infamous history with doping it’s not a surprise to see them in the top 5 either. But it was definitely a surprise to see France topping the list, and Italy not far behind. These top 5 countries are responsible for over 40% of all doping violations from 2001-2013. One country is of particular interest to me. Of the top 5 doping countries, only Brazil was not a swimming powerhouse in 2001. Brazil had no World Championship aquatic medals in 2001, 2003, 2005 or 2007. (World Championships are only held in odd years). During this same stretch it also had only 7 of its 28 doping infractions. Here’s a chart to show the progression. After 2007 it gets a little wild. We can clearly see here that a few years after the positive doping tests started to come out, Brazil started improving. In 2010 and 2011 Brazil had the highest number of positive tests of any country in the world. And a few years later had an incredible 10 World Championship medals in 2013. The question remains as to whether the two are related. We’ll never know for sure, but the data is certainly suggestive. Brazil also highlights another problem with the positive testing process. 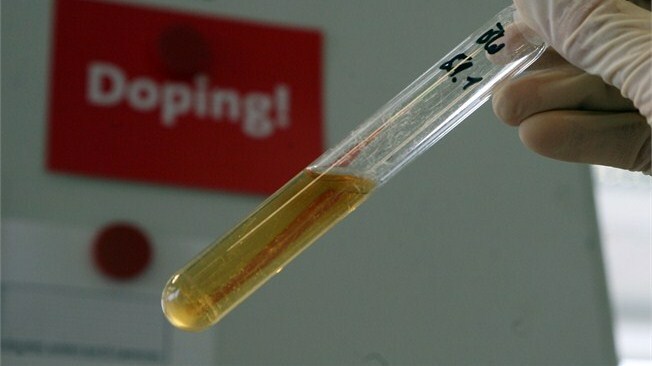 In 2011, world record holder and reigning world champion Cesar Cielo and 3 other Brazilians tested positive for furosemide, a banned masking agent. The Brazilian doping control panel saw fit to only warn them – no suspensions – based on no prior history of positive doping tests, and personal claims that the drug did not enhance their performance! (Of course it didn’t enhance performance; furosemide is used to mask the real performance enhancer.) FINA investigated with an eye to overturn the warnings and provide suspensions. However, the Court of Arbitration for Sports overruled FINA in favour of just a warning. And ultimately this is the problem. Some research on mice has suggested that the effects of steroids may last for years (here). And yet penalties for positive tests are getting weaker and weaker. Suspensions handed out by national swim organizations now vary from as little as a warning, or a one-month suspension, to a few years at the very most. Swimmers are breezing through those suspensions, and then coming back almost immediately, possibly with the performance enhancing effects still in place. It’s hard enough to catch those who dope. But when you catch them and the penalty is trivial, it’s only going to encourage others to dope. In addition, WADA has issued a new draft of its Anti-Doping Code 2015 (here), where it proposes a harmonized set of new and tougher penalties. Hopefully this will stop some of the ineffective warnings and short suspensions that are doing nothing to deter doping at the moment. The way I see it, there are three compelling reasons for not using performance enhancing drugs: health risks, ethical reasons, and personal satisfaction. Almost everybody is aware of the first two, but for me the most compelling reason is the third. Beyond the very real risks of health problems, beyond the risk of public ridicule and humiliation, is the personal knowledge that you either performed as an athlete cleanly, or you cheated. You may be the only one who will ever know, but that’s enough. When your career is over, you can either take enormous pride in what you achieved. Or you can realize that your achievements were tainted. That is a strong and stark comparison, and a sentiment that the athlete will live with for the rest of their life.